UPDATE: For Black Friday weekend, Amazon’s also offering a 32% discount on their old tablet-sized Kindle DX! Wow! Amazon announced four new Kindles yesterday, including a cheap $79 Kindle. (I’ve spent the last 24 hours studying all the cool new features!) As expected, Amazon announced a color, iPad-style tablet, and they also announced three new versions of their beloved black-and-white, e-ink Kindles. All but one of the new devices come with a touchscreen keyboard (instead of having a keyboard built into the plastic frame), and Amazon will start shipping them to customers on November 21! The most interesting surprise was that cheap $79 Kindle. It’s a new version of Amazon’s “Special Offers” Kindle, which uses slick advertising images for screensavers (and offers other deals at the bottom of its Home page). 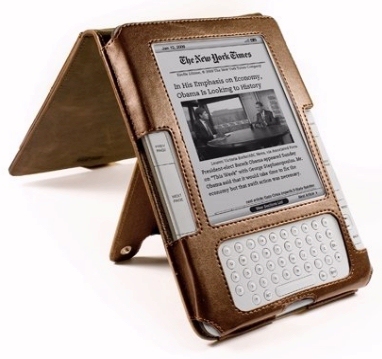 The earlier version became Amazon’s best-selling Kindle, due to its low price of just $114. Now the new version is $35 cheaper, though for $30 more, you can get another version without the special offers. The screen on the new $79 “Kindle” is still six inches (diagonally), though the device is now 18% smaller — just 6.5 inches tall — because Amazon’s replaced the built-in keyboard with a virtual keypad “that appears just when you need it.” It’s also 30% lighter than previous Kindles, weighing less than 6 ounces. (Previously the lightest Kindles were 8.5 ounces – and even the smallest Nook weighs 7.48 ounces!) But the biggest difference is its low price. Remember how exciting it was when refurbished “Special Offers” Kindles appeared for $84? Now the everyday price is even cheaper! It also ships with the “Special Offers”, and it seems to be very similar to the new $79 Kindle, except its battery life is twice as long. Like the $79 Kindle, the $99 version can also only connect to the Kindle Store and the web through a local WiFi connection, though there’s also a 3G version for just $50 more (which also ships with the “Special Offers”). 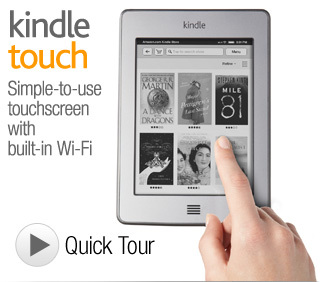 Ad-free versions of both the 3G and WiFi Kindle Touch are also available for $40 more. X-Ray will include pointers to each book’s Wikipedia page — and it also displays information from Shelfari, an online book community that Amazon acquired in 2008. (It’s a kind of social networking service for book lovers.) On Shelfari’s web site, users create virtual bookshelves, where they can review and rate books they’ve read, and even tag and discuss them. But on the new Kindle Touch, users can access a book’s plot summaries, quotes, character descriptions and other “fun book factoids”. I was hoping Amazon was going to announce a big upgrade for the web browsers, but it looks like they saved that for their fourth new Kindle — the color, 7-inch tablet, “Kindle Fire” tablet. Amazon called it “a new class of Kindle that brings the same ease-of-use and deep integration of content that helped Kindle re-invent reading – to movies, TV shows, music, magazines, apps, books, games, and more.” Translation: it can play video, and it makes it easier to shop in the Kindle store. It lets you shop for over 100,000 movies and TV shows to watch in Amazon’s online video store, and over 17 million songs from Amazon MP3. (And if you’re a member of Amazon’s “Prime” shipping service, over 11,000 movies and TV shows are free!) Amazon will always remember your position in a video if you need to finish watching it later — just like they do for Kindle ebooks. And obviously, the Kindle Fire can also display ebooks, many of which are now in full-color, including “thousands” of bestsellers, children’s books, comic books and cookbooks. Its screen is one-inch larger than a regular Kindle’s screen, and “the Kindle Fire display is chemically strengthened to be 20 times stiffer and 30 times harder than plastic,” according to Amazon, “which means it is incredibly durable and will stand up to accidental bumps and scrapes.” It displays 16 million colors in high resolution, and will weigh in at 14.6 ounces. Let the new era of Kindles begin!